Apple has announced that 32-bit apps have a limited future on the Mac: They’ll be fully supported in this fall’s High Sierra release; macOS’ 2018 release (“Really High Sierra”) will “aggressively warn” users about 32-bit apps, and I would assume, they won’t work at all in the 2019 version of macOS (“That Was My Skull!”). But how do you know which apps on your Mac are 32-bit and which are 64-bit? MacObserver has an article that discusses the easy way, via the System Information app—just look in the Software > Applications section, and you’ll be able to see a list of apps and a 64-bit Yes/No column. But seeing the list is all you can do—you can’t easily save the list for future reference, for instance, nor can you copy/paste the info to another app. This does the same thing as the System Information app, but it dumps the data in text form; the greater-than sign redirects the output to a text file named non64bit.txt, saved to your desktop. The grep is used to show only the 32-bit applications (the full line reads 64-Bit (Intel): No), and the -B and -A options are added to capture the lines before and after that line in the output. This is probably not overly useful to most people, but I wanted a way to capture the list of apps, as I have over 290 32-bit apps on my machine, and it takes a while to run the System Information report each time. 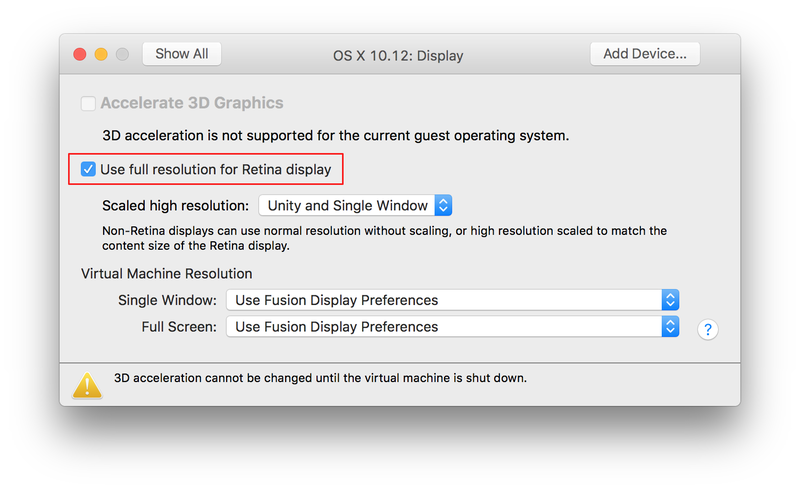 Mac OS X running in a virtual machine is limited to an approximate resolution of 2560 x 1600, and treats the display as a standard DPI device. This makes the text and icons to appear small in the OS X interface. However, today I stumbled across this solution from Patrick Bougie—and it’s brilliant in its simplicity. Patrick’s post has all the details; I’ll reproduce them here in abbreviated form, just in case his page ever vanishes. As you’re probably aware, Apple changed the functionality of a green button click in Yosemite: it not longer “zooms to fit” (which could have different behaviors per app), but instead it enters Full Screen mode (if the app has one; otherwise, it does zoom to fit). If you want zoom-to-click, you can option-click the green button; there’s no apparent way to toggle these two functionalities. But today, I discovered a second zoom-to-fit shortcut: double-click the window’s title bar. This is easier to do, as you don’t have to hit the small green button target; just get the mouse anywhere in the title bar, and double-click. Note that this won’t work if you have “Double-click a window’s title bar to minimize” enabled in the Dock System Preferences panel.